CONCORD, NC - As a follow-up to the Water Medic Southeast Showdown for the RLV Tuned Exhaust Products Gold Cup Series, held recently at 103rd Street Sports Complex in Jacksonville, Florida, there is an update on the tabulation for the Chassis Standings. Coyote Racing Chassis is awarded 7 wins, not 9, following the event. The change is a result of the rule that does indeed cover all national series, in which a chassis victory can only be credited to classes that host a minimum of 3 entries. The results of the Senior Pro Gas class were mistakenly recorded. 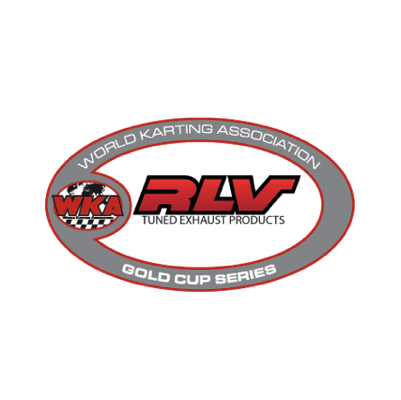 The next event for the Gold Cup Series will be July 28-30 at Thompson Kart Raceway in Ohio. Entry information for that event will be coming out shortly! Hope to see you there. CONCORD, NC - After just missing out on the 2016 Manufacturers Championship Trophy by a mere victory, Coyote Motorsports, led by Mark and Jim Lipari, came to Jacksonville, Florida with a vengeance, leaving the Water Medic Southeast Showdown for the RLV Tuned Exhaust Products Gold Cup Series at 103rd Street Sports Complex with a 7 win edge over 3 of their rivals in the sport. 3 Chassis manufacturers are tied for 2nd with 2 wins apiece, as Ionic Edge, MGM, and Razor all found success over the weekend as well, Ionic Edge with Brian Van Cleve in the Junior LO206 ranks, MGM with Justin Vanderzee in the CIK LO206 Senior class, and Timothy Clark in Masters Senior, while Owen Lloyd powered Razor to 2 wins in the Boon and Sons Sportsman LO206 class. Comet Chassis checked in for 1 win over the weekend, with James Vanderzee taking the CIK LO206 Senior main on Sunday. The battle for the top chassis spot continues July 28-30 when the series heads to Thompson Kart Raceway in Ohio for stop #2 for the series! CONCORD, NC - For the second season in a row, the opening round of the RLV Tuned Exhaust Products at 103rd Street Sports Complex in Jacksonville, Florida not only encompassed the energy of a season opener, it also paid tribute to the 2016 national champions, top award recipients, as well as many other special award honorees. One of the many special moments of the weekend was honoring the WKA Karting Family of the Year, presented to The Vrabel Family from the Midwest. Due to a most unfortunate automobile accident involving Renee Vrabel, the family, whose son Alex competes in Junior competition, as well as dad Jon as the head wrench, were unable to attend. WKA sends its sincerest sympathies and well wishes for a speedy recovery to Renee and the entire family. Also missing, but receiving the Sportsmanship award was Jacob Connors from Maryland. Running in 2 of the toughest classes in the program, the Senior Pro Gas Medium and Heavy last year against Jacob and Jimmy Heavlow was tough. But Jacob stood tall in the midst of some tough competition. The battle for the top chassis manufacturer for 2016 may have been the closest ever, with Arrow Racing Chassis, again led by the Heavlow brothers, accounting for their part in the 24 victories, narrowly edging Coyote Chassis by 1 win, with Razor Chassis finishing third. WKA also recognized the Most Improved Junior Driver for 2016, with young Blake Boon making a smooth transition from Kid Karts to the Sportsman ranks, taking the Sportsman Gas Lite title in 2016, as well as finishing 3rd in the Sportsman LO206 Class last year as well. Many champions were also recognized, with winners receiving generators from Briggs & Stratton, as well as a set of tires from Bridgestone, not to mention Championship Eagles and other merchandise. 2nd place received a Gold Cups, as well as Kart Stands from RLV, and other merchandise. CONCORD, NC - The season opener for the RLV Tuned Exhaust Products Gold Cup Series not only welcomed back many of the fine families in the sport of 4 cycle racing, it also produced some new national winners from competitors who have been digging hard the last few years to get to the top shelf of the podium. Leading the way in the new national winner category in the Water Medic Southeast Showdown were Austin Williamson and Owen Lloyd. For Williamson, his wins came in the GT Machine Junior Pro Gas classes both days, while Lloyd, a graduate from Kid Kart competition, took down both days of the Boon and Sons Sportsman LO206 Class. Williamson began his weekend sweep with a win in Saturday's second race of the day for the GT Machine Junior Pro Gas class. Graduating from the Sportsman ranks very successfully, Elmer Edmonson challenged Williamson throughout, coming home second in his Junior debut, with Macon Moore and Brian Van Cleve rounding out the order. Williamson took day 2, with Brian Van Cleve, Edmonson, and Moore rounding out the top 5. For the weekend, Williamson was the overall class champ, with Edmonson and Van Cleve rounding out the top 3. Weekend Champions in all classes received Power Washers, courtesy of Briggs & Stratton, with Tool Sets going to both the second and third place finishers. For Lloyd, a graduate from the Kid Kart ranks, the weekend sweep marked his first 2 WKA National event wins in the Sportsman ranks, taking the Boon and Sons Sportsman LO206 Class results both days, first fending off Blake Boon on Day 1, followed by Fast Timer Camden Gruber, Camryn Reed, and Brentley Miller. On Day 2, Camryn Reed, one of the newest young female talents on the series, and fresh off a third place finish in the Sportsman Shootout Friday, came home second, followed by yet another Kid Kart graduate in Brentley Miller with a fine third place run. Gruber, the fast timer again on Day 2, was 4th, followed by Boon. For his sweep, Lloyd was also the weekend's overall champ, with Reed and Gruber the top 3. Fresh off a 2016 championship, Blake Boon went right back to work in Event #1, claiming the GT Machine Sportsman Pro Gas Classes. Boon, however, found some stiff competition from Fast Time winner Camden Gruber both days, as Gruber tailed Boon to the stripe, with Owen Lloyd and Camryn Reed rounding out the field each day. Boon took the Fast Time on Day 2, as well as the Overall title for the weekend, over Gruber and Lloyd. Boon also took the Friday Night Sportsman LO206 Shootout, netting $200 for the weekend. The last sweep of the weekend came for Brian Van Cleve in the Junior LO206 category. Fresh off his $200 win in the Friday Night Shootout for the Junior LO206 Class, Van Cleve took control of the weekend, netting the Saturday national event win over Austin Williamson, followed by Edmonson, Sportsman graduate Kevin Lanyi, and Collin Miller. Much like Edmonson, Lanyi, fresh off a 2016 Sportsman title, began to find his comfort zone in the next age level, shadowing Van Cleve in second, with Moore, Edmonson, and Miller making up the top 5. For his efforts, Van Cleve was the weekend's overall champion, followed by a pair of freshman in Lanyi and Edmonson. The Target Distributing Senior LO206 Class found some extremely tough competition both days, with the local contingent turning back many of the outside invaders in the series first race of the year. Day #1 found Florida product Matt Mayes scoring a popular win over New Yorker Jim Lipari, with Marylander Jimmy Heavlow, Aren Lloyd, and Brandon Murzynski rounding out the top 5. Worth mentioning was Sean Meier’s 6th place run, as the Florida driver made a stellar run from the back of the 15 kart field. Day #2 found yet another local hotshoe in the form of Jason Yarbrough taking the last lap victory in exciting fashion, with Aren Lloyd again checking in for a top 5, taking second, with fast timer Sean Meier, Tyler Lloyd, and Michael Clark making up the top 5. By virtue of his top 5 consistency, Aren Lloyd was the weekend's overall champion, with Matt Mayes and Jim Lipari the top 3. The series also debuted a new CIK LO206 Senior Class with the Vanderzee brothers, Justin and James, sharing the weekend wins. Justin took Day #1 over James, with Michael Gay coming home third, while the brothers flip-flopped the end result on Sunday, with James the winner, Justin second, and Brian Collins checking in for a third place finish. James Vanderzee took the Overall weekend top honors, with Justin second, and Brian Collins the top 3. Since its debut 1 season ago, the Masters Senior class has been full of tough competition. That statement was again backed up into a new year, with a pair of winners over the weekend, as Brad Farmer took the Day 1 honors over New Yorker Tim Stiefel, with Timothy Clark, Joey Miller, and Kevin Medearis making up the top 5. Day 2 found Clark, in a backup kart, following extensive damage on his primary kart in the heat race, taking the win over Farmer and Stiefel, with Medearis and Vernon Sparks completing the top 5. Farmer was the weekend's overall champion, with Clark and Stiefel making up thetop 3. With the weekend tucked in the books, the series points to the second event of the 3 race national program, coming July 28-30 at Thompson Kart Raceway in Ohio, with the finale being the Grand National Oct 6-8 at Lamar County Speedway in Barnesville, Georgia. Special thanks to Briggs and Stratton for providing major product to the weekend's overall champions, as well as Water Medic for the title sponsorship of the series first event of 2017. Thanks also to Coyote Motorports, GT Machine, Boon and Sons, and Target Distributing for their tireless efforts to help make the first event of the 2017 season a great success.